Here it is … an exclusive first peek at the cover for Exile for Dreamers. 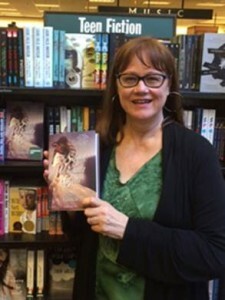 Kathleen with a copy of her first book. There is no thrill like finding yourself on a bookstore shelf. In fact, this cover idea was decided on by the marketing department only 7 days ago. Did I say 7? That’s like a week, right? A week has seven days in it, last time I checked. So. Seven. That seems like a really short time ago, amiright? Somewhere in the above section is a not-so-secret number. Find it. You’ll need it to continue your hunt. Trust me on this. In Exile for Dreamers you’ll find out what happens between the prophetic dreamer, Tess, and the brooding Lord Ravencross. Just like Tess, this story starts out running and doesn’t let you catch a breath until it’s over. 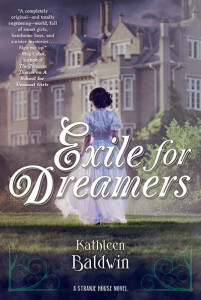 You can find an excerpt on Kathleen’s website. Kathleen will be giving away a copy of A School for Unusual Girls to one lucky YA Scavenger Hunter. To keep going on your quest for the hunt, you need to check out the next author, Lori M. Lee. She’ll have the next piece of our puzzle!